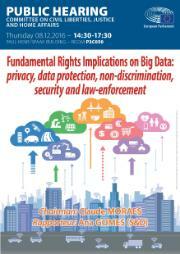 On 8 December 2016 the LIBE Committee organises a hearing on the Fundamental Rights Implications on Big Data: privacy, data protection, non-discrimination, security and law-enforcement in the framework of the own-initiative report by the LIBE Committee on this topic (rapporteur Ms Ana GOMES (S&D)). It aims to address the implications of big data on fundamental rights, both as regards the use of big data for commercial activities or for public administration or law enforcement purposes. The guest speakers will provide the LIBE Committee with the views of different actors involved: industry, consumers, NGOs, public administration, law enforcement sector, European Data Protection Supervisor and the European Commission. Big data has the potential to bring undeniable benefits and opportunities for citizens, businesses and governments. The fast growing and development of new information technologies, which become cheaper and affordable, is making easier for companies and public authorities to engage in advance processing techniques using complex algorithms to correlate personal data and information in order to identify patterns, trends, predict or shape human behaviour of large categories of population for a broad range of different purposes. But big data also entails significant risks, namely with regard to the protection of fundamental rights as guaranteed by the EU Charter and Union law.